Straight out of Switzerland The Peacocks have been playing double bass driven punk rock since 1990. That is long before a band they are often compared to, Australia’s The Living End, had even formed. 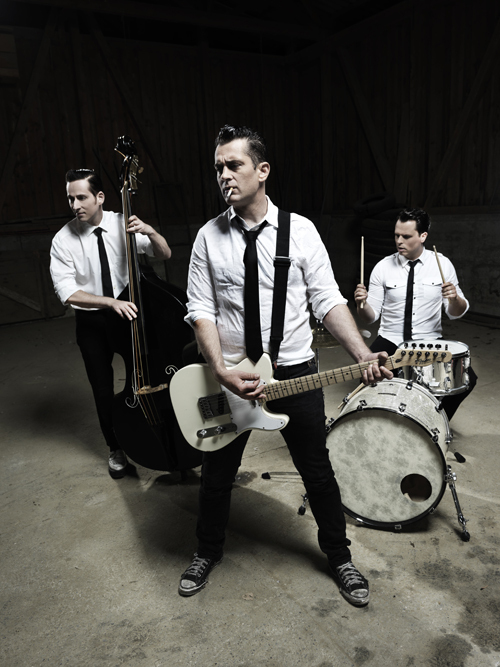 The comparisons are justified though, rockabilly influenced punk trio with hard-hitting, excellently observed and aware lyrics that have transcended genres. The original line-up with founder member Hasu Langhart, guitarist and lyricist at the helm hit the road hard in those early days playing 100′s of shows all over Europe, after just a year current bassist Simon Langhart was also on board. The hard miles paid off when the rest of the world began to take notice after the 1998 release of ‘In Without Knocking’, a tour of Japan, Canada and North America followed. The Peacocks went down such a storm in North America that they were spotted by Mike Park at Asian Man Records, the home ofThe Alkaline Trio amongst others and promptly signed them to release their next album, the acclaimed ‘Angel’. Shortly afterwards the current drummer Jurg Luder joined the band and the permanent line-up was complete. 2004 saw the release of their next album ‘It’s Time For…..The Peacocks’ this album was on five labels in five countries and three continents. In the UK the album was released by Household Name Records who had championed the careers of Capdown and The King Blues. Another world tour followed promptly. The Peacocks label-hopping came to an end in 2007 when they signed to People Like You Records. They stayed in the USA after that leg of their tour to record PLY debut ‘Touch and Go’ at Sonic Iguana in Lafayette Indiana, this was followed up by the mini album ‘Gimme More’ then ‘After All’ in 2010. 2012 saw the release of ‘Don’t Ask’ on People Like You Records, a 14 track stomper of an album that is all that we have all come to expect from The Peacocks – Explosive, rockabilly influenced, stand-up bass driven punk rock, addictive and as catchy as hell. On tour in the UK in August.